12' The famous 'Great White Cherry' This variety has the largest flowers of all with blooms up to 2" across. 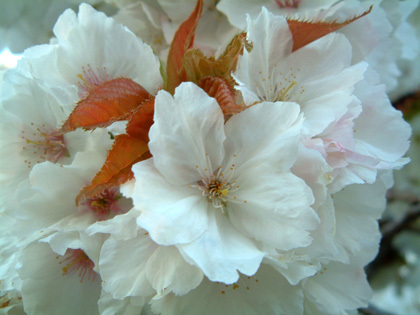 In April the pinkish buds open to the most dazzling pure white flowers which contrast beautifully with the coppery red of the new leaves. A strong growing small to medium sized tree that excels again in the Autumn as the leaves turh rich yellow and then orange. Outstanding.